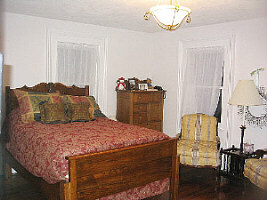 Welcome to the Chateau Bed and Breakfast. 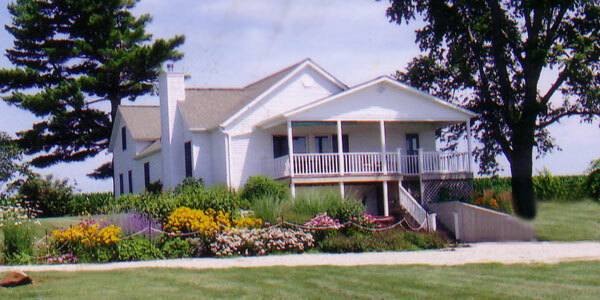 Come to unwind in an 1841 farmhouse, surrounded by the rolling hills of the vineyard. Enjoy strolling the ground of the vineyards, sampling the fine wine and visiting our area attractions. A night at the Chateau is a step back to a more tranquil time. It is said that Lincoln stopped to rest in this upper-room after speaking on the lawn of the courthouse in Toulon (before heading north), hence the room's name. Furnished with original furnishings of the Sams family, including the chair Lincoln sat in, you will find this room and view to your liking. Even though there is not an attached bathroom (half-bath at bottom of the stairs and shared facilities nearby) it is one of the favorites among our guests. Cosy and comfortale is the best way to dexcribe this room. This room has an attached bathroom that includes a separate shower and an old fashion claw foot tub good for soaking the stress and strin of the day. 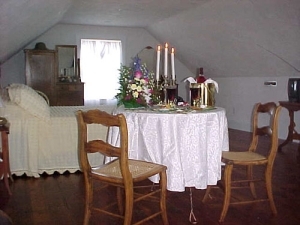 Located in the lower level of the Chateau it has many distinct qualities, including a private entrance with easy accessibility from the circle-drive, a full bath directly down the hall from your room, robes provided, a hospitality room for your use complete with sofa, television and, table and chairs. 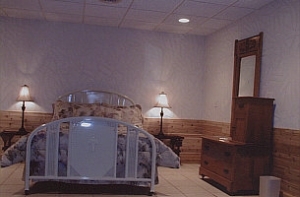 All rooms Monday - Friday include a continental breakfast. All rooms Saturday & Sunday include a full breakfast. Extra amenities available upon request. Copyright © 2008 Indian Creek Vineyard, all rights reserved.